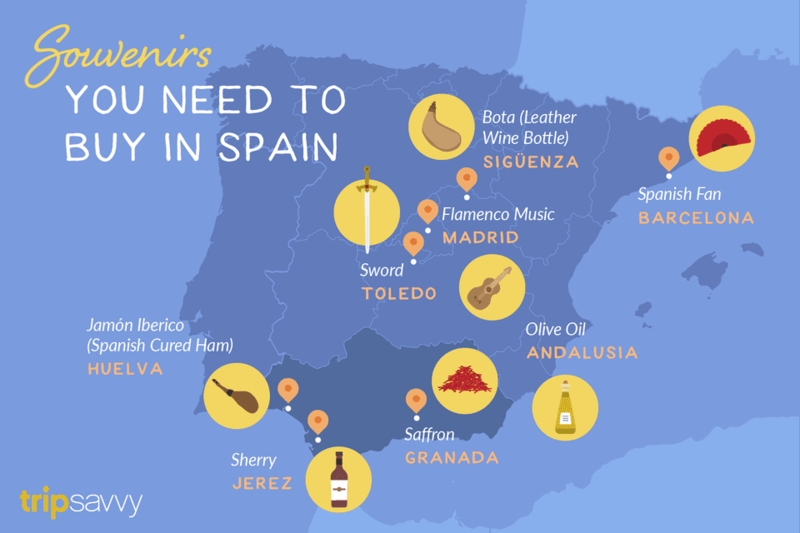 When planning your journey to Spain, be sure to leave room in your bags to bring back souvenirs like a leather wine bottle, a Spanish fan, or a bottle of sherry. Whether you're shopping for the perfect gift for a loved one or just want to get yourself something to remember your trip by, there are plenty of local shops around major tourist destinations like Barcelona and Madrid where you can support local artists and bring home a piece of the culture. Keep in mind that some items like handmade swords and Spanish spices may require additional screening at the airport—and most definitely cannot be packed in a carry-on bag—so check travel restrictions on your airline before making a major purchase of items like these. Every "best souvenir" list needs at least one tacky item that really encapsulates being a tourist in another country, and for Spain, that item is a bullfighting poster from Seville with your name on it where the bullfighter's name usually appears. Although these are particularly popular in Seville, they can be found wherever there is a bullring. Great for kids, these bullrings also typically print flamenco posters as well—in case you have a dancer in the family. To find vendors that make these, look out for signs that say " tu nombre aqui," which means "your name here" in Spanish. Toledo has been famous for its steel for centuries and its swords and shields were equipping Europe's cavalry right up until firearms rendered them useless. Made now exclusively for tourists, they are still good quality and perfect for fans of historic weaponry. If you don't have a real need for a sword, a letter opener made from Toledo steel can be bought for about $12. Whichever one you buy, though, keep in mind it will either need to be shipped home to the United States or stored in your checked luggage—if it fits. Wine is made throughout Spain, but none is as distinctive as vino de Jerez, known as sherry in English. If you've never tasted sherry, expect something a little different from your usual wine. The particular ambient weather of Jerez and the way in which sherries are fortified give them an unusual taste that takes a little getting used to. You can buy bottles of sherry in Jerez for around $6, but an even better souvenir would be to bring your own bottle to a tabanco (sherry bar) in Jerez and ask them to fill you up straight from the barrel. Jerez is also home to Spanish brandy, a more grapey version of cognac that's easier on the palette. A hot summer's day in Spain is not complete without middle-aged Spanish women fanning themselves with an abanico. They might seem a bit tacky but Spanish women swear by them, and they're actually quite effective for buildings that don't have air conditioning. Abanicos in Spain originated around the same time Flamenco dancing became popular there and have been used by nobility and performers alike for centuries. Flamenco is still alive and popular throughout Andalusia, Madrid, and Barcelona, where you can go into a specialist flamenco store and ask the assistant for help in choosing a CD. Although there are many top Flamenco artists for you to consider, you can also check out new talent on the streets of Spain or head to one of the many flamenco festivals around the country in the summer. Buy your favorite act's record so you can share the culture and music with your friends and family back home. The Spanish talk about their ham like the French speak of their wine. Cured for at least a year, often two, jamón is a staple part of every Spaniard's diet. Sadly, there are a bit of the "emperor's new clothes" about it and much of the meat is a little unpalatable for those not brought up on it. Buy your jamón from Huelva, Salamanca, or the Alpujarras, near Granada; the chorizo (spicy sausage) is good from there, too. Although this popular Spanish brand of t-shirts can be found all over the country, this Basque company has a store in Madrid near the Metro: Opera house. Just like when visiting New York City, you can get an "I (Heart) Madrid" t-shirt or opt for a more creative homage to your vacation in Spain. Saffron, or azafrán in Spanish, is an essential ingredient in paella and makes any Spanish dish taste more authentic. Saffron is rather expensive when imported to the United States, so buying it domestically in Spain could save you some money and give you better ingredients to bring home. The cheapest place to get this spice is near the cathedral in Granada, where merchants also sell other spices like té Pakistani, a black tea with cinnamon, vanilla, and cardamom pods. You can pretend you're a Spanish peasant taking the long journey from your home in the countryside to the market in the next town over with a bota, a leather wine bottle perfect for drinking on the go. The black version is the authentic one and costs about $36 while the pale one is a touristy one that is significantly cheaper. All botas have tiny drinking holes; the idea is to squirt the wine into your mouth without the bottle touching your lips, which may take a little while to get used to but learning how is quite a bit of fun. Although it's not recommended that you fill your bota with Spanish wine before your flight home, you are more than welcome to bring your new souvenir with you on one of many wine tours of Spain while you're there. Spanish olive oil is some of the best in the world—despite what the Italians and Greeks say—and Jaen in Andalusia makes half of all that is made in Andalusia, a third of all of Spain's oil, and a tenth of that consumed in the entire world. It might be a little difficult to carry large quantities home, so either buy a small ornamental bottle (and refill it constantly with Spanish oil bought at home) or fill every last space in your luggage before you leave Spain with some larger bottles. Every grocery store in Spain stocks an impressive selection of olive oils.